The iF Design Award is considered by experts to be the top international comparison when it comes to high-quality, functional industrial design. It is one of the most recognized design competitions in the world. All the more reason for us to be delighted and honoured that the L1® Mandible ReconGuide convinced the jury consisting of 67 members in the criteria of innovation, ergonomics, design and sustainability and won this important award. Today, our team of product manager and developer received the award at the iF Design Award Night at the BMW Welt in Munich. 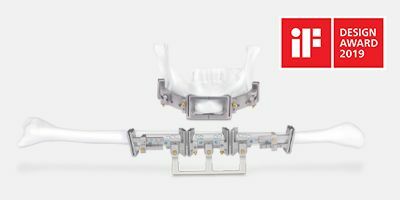 The L1® Mandible ReconGuide will be exhibited at the iF design Museum in Hamburg from 06-20 to 07-14.2019. At the same time the official market launch takes place on the occasion of the DGMKG 2019 in Frankfurt, Germany.